If you follow the SheppyBrew Facebook page or my twitter feed, you likely know that I made Greek yogurt this weekend. 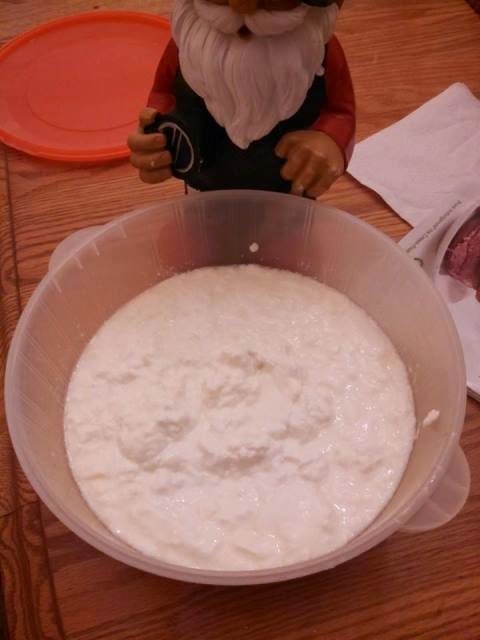 I was inspired by my sister, Mrs. Bluefield, and her blog post Creamy Homemade Greek Yogurt. 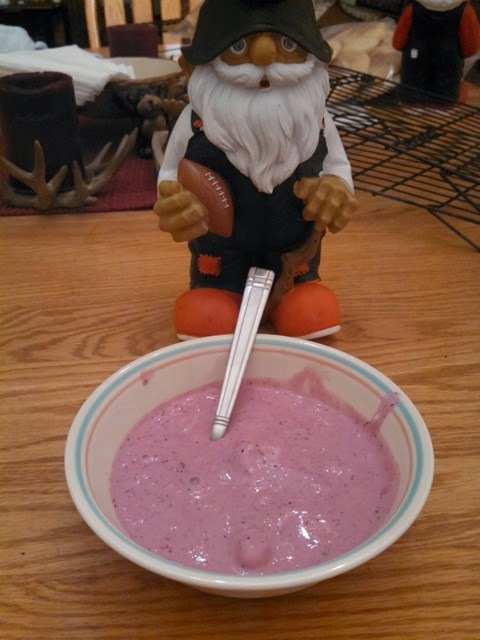 Actually, she also blogged about homemade yogurt back in August, at which point I decided I needed to give it a try. I'm not sure why it took me so long. If you followed the link to her posts (which you totally should), you probably know that the process is ridiculously easy. It is time consuming, but all but about 15 minutes is waiting for the magic to happen. Seriously simple. Heat the milk. Cool the milk. Inoculate the milk. Wait. Those are the steps. If you want Greek yogurt, you need to strain off some whey. Step 1: Heat your milk. 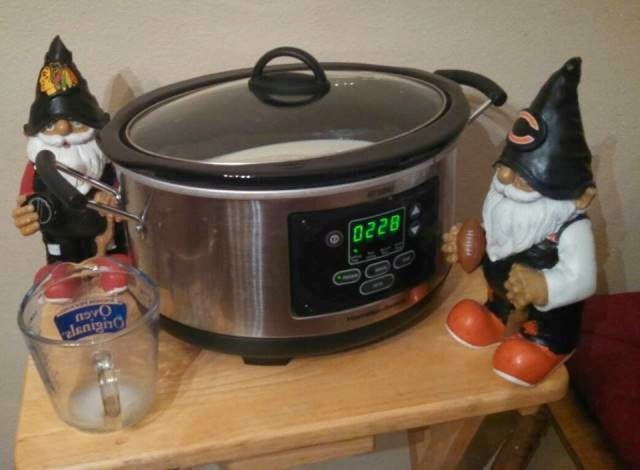 I, like Mrs. Bluefield, heated the milk in a crock pot. She didn't mention a temperature, and I didn't measure mine, but based on other references, the milk should get to 185ºF. The reason for this step is to "denature" the whey proteins to allow a more stable gel. I think maybe this step also provides some pasteurization, but that isn't really that critical if you don't use raw milk (I didn't). I simply trusted Mrs. Bluefield's process of leaving the crock pot on low for 2.5 hours. As I mentioned, I don't know what temperature my milk got to, but based on the final results, I'm going to say it was the right temperature. Personally, I used skim milk, mostly because that is what we had in our refrigerator. You can use any fat content you want. It really depends on your personal taste. Step 2: Cool your milk. The milk needs to cool to around 110ºF. Too much higher, and your bacteria will die. Too much lower, and your fermentation will take a long time. According to Milk Facts, 108ºF is ideal, but I would say anything between 85ºF and 120ºF is fine. In fact, I'm sure the temperature could even go a little lower. Again, I just followed Mrs. Bluefield's process of cooling for a set 3 hours. I did actually check with my thermometer, and 3 hours was about perfect. To ferment into yogurt, you need bacteria, mainly Lactobacillus bulgaricus and Streptococcus thermophilus. I got these by just running to the grocery store and picking up some plain yogurt. Of course, as Mrs. Bluefield points out, make sure the packaging of the yogurt says something like "Active Cultures". I think you can also go to a health-food store and specifically pick up "yeast cultures", but the grocery store was more convient for me. In my next batch, I will just add some from this batch. 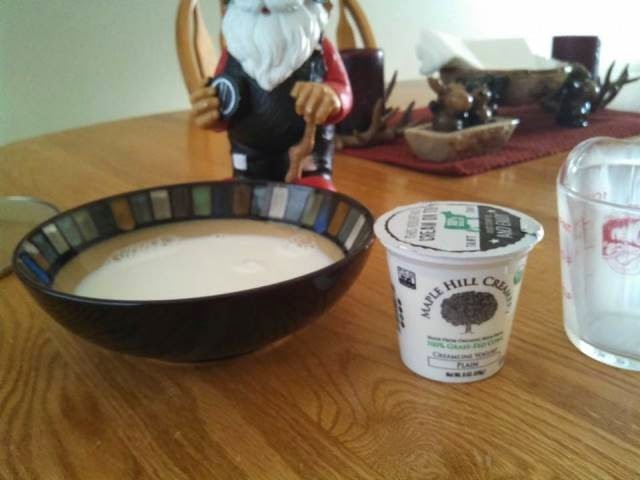 However you get this "starter", simply add it to your milk, and mix the two together. It is really that simple. Step 4: Let the bacteria do its thing. You do want to keep the bacteria happy, which means keeping the temperature as close to 108ºF as possible. Mrs. Bluefield simply wrapped her crock pot in a towel. I did the same and put that into our oven, which I had heated to around 120ºF. Every once and awhile, I heated the oven to 150ish or so and then turned it off. Basically, though, just let the bacteria ferment the milk for 8 hours. The bacteria interacts with the milk lactose, making lactic acid. The lactic acid causes the milk to basically clot into the soft gel that is characteristic of yogurt. This fermentation of lactose also produces the flavor compounds that are characteristic of yogurt. At some point, I might try just adding lactic acid to milk to see how that turns out differently. (Yes, I'm a geek). Once you are done waiting for the bacteria to do its thing, there will be liquid separated from the yogurt gel. This liquid is the "whey". If you want, you can strain this off, making Greek yogurt. Of course, if you don't want the creamier, more solid "Greek yogurt", you can just leave the whey in there and mix it up. Personally, I did strain. I put down a couple of paper towels onto a colander and dumped the whole batch into that. I let it sit for about 45 minutes and then scooped the whey-less yogurt into a container and put it in the fridge. You can decide if (and how much) of the whey to remove. It has been a long time since I've had plain yogurt. Usually, what I purchase from the store will be those little yoplait containers with fruit in them. I was pleasantly surprised how much I liked my homemade yogurt plain. It is certainly not as sweet as what I'm used to in yogurt. In fact, there is a bit of a lactic tartness. To me, it tasted awesome, though. A bonus is that this is much less expensive than buying yogurt as the grocery store. After going through this process, the cost per ounce of store-bought yogurt seems ridiculous. And, of course, I can (in fact Sunday morning, I did) add fruit. It still was not as sweet as store-bought, but I am ok with that. I do not think my kids would like my yogurt plain, but Mrs. Bluefield has kids as well and has some suggestions. See Home Made Orange Creme Yogurt on her blog for what she did. Stay tuned on this blog. 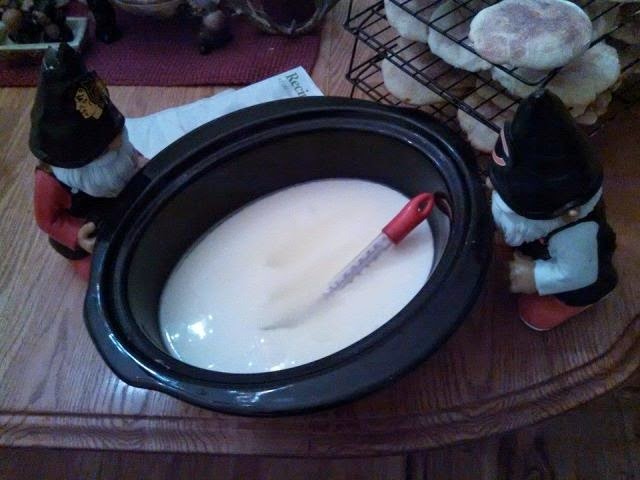 I am planning on making some frozen yogurt with my homemade batch (or maybe it will end up being a future batch. I'm excited about that.